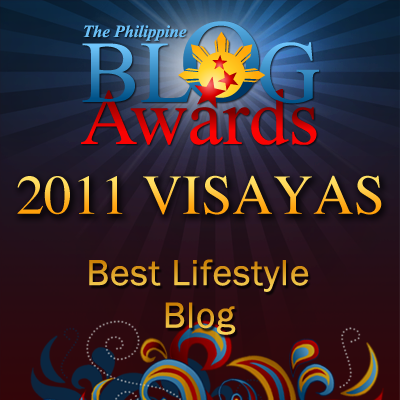 Random Thoughts of Gil Camporazo: Sophie Ashley Lory - What's in a Name? Sophie Ashley Lory - What's in a Name? The spirit child of God, an angel arrives to a family today. She is named as Sophie Ashley Lory. At 8:05 this morning, we have a new member of our family. It is the 5th granddaughter we have, out of our 7 grandchildren. This granddaughter is the 3rd daughter of our 4th eldest daughter. She falls short of 5 days of her mother's birthday on January 15. They both share the same zodiac sign of Capricorn which covers December 22 to January 19. Capricornians are determined to achieve their goals in life for they are patient and persevering. They are conservative and cautious in their dealing with their tasks, but there are time that they are daring to do something unusual just to reach success in their business dealings or even in love relationship. As a friend or associate, they can be relied upon for they are sympathetic. Mountain goat is the symbol that represents the zodiac sign of a Capricorn. In Chinese calendar, Sophie is born in the year of the water snake for 2013. 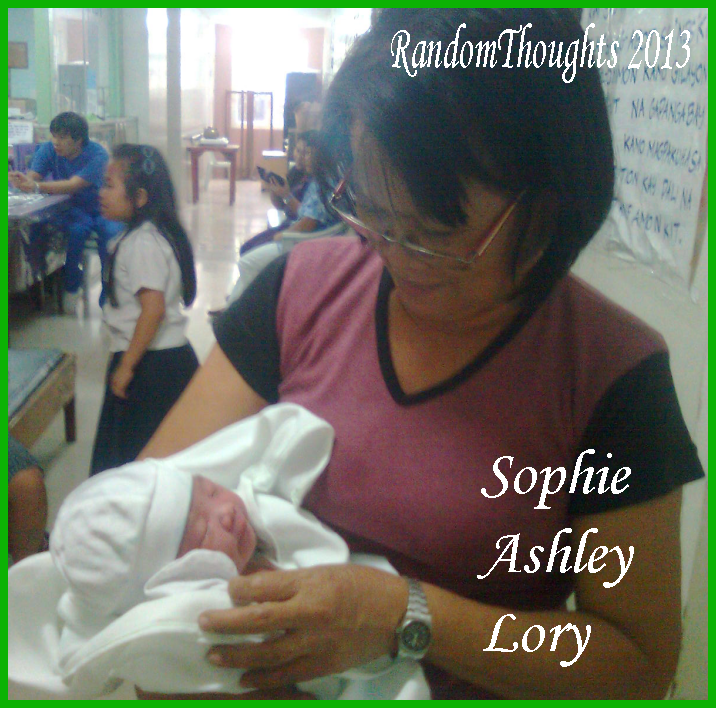 Sophie Ashley Lory, What's in a Name? Her parents wanted their child to be full of wisdom and as mentioned "can be relied upon" for such wisdom. So they came up for her first name as SOPHIE, from Greek word "sophos" means wisdom. As a parent, of course, who wants their children be successful and noted or known, they added ASHLEY to mean something about a "celebrity". And to complete the child's name, as a grandfather, I suggested to include LORY derived from the word "lore" which refers to a font of knowledge and at the same time a short name or variance of my mother's name, LORENZA. My point here is to leave an eternal imprint of the memory of her grandmother's name as her genealogical root for that matter. SOPHIE ASHLEY LORY is now a part of our family. We all gladly welcome here to our family as her grandmother's (my wife) term, "an angel"; mine is "the spirit child of God." 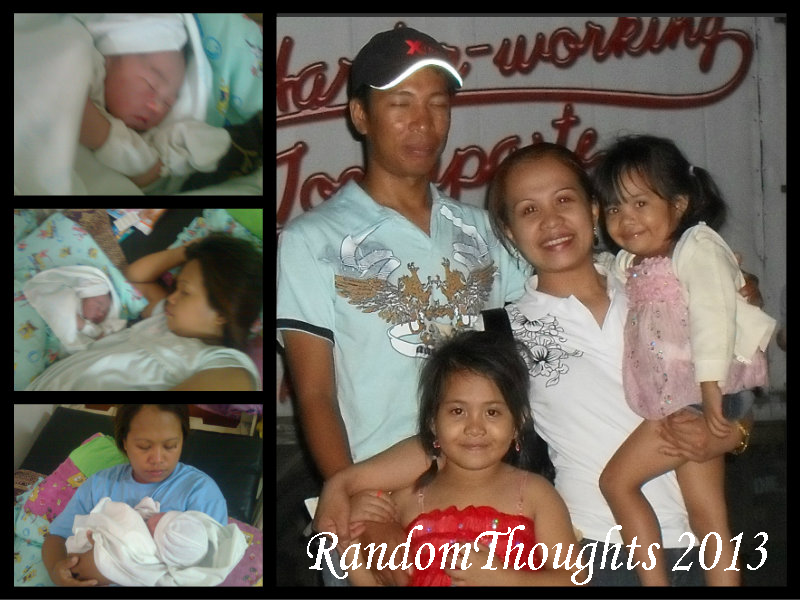 This cute infant weighs 8 pounds (3.6 kilos) and stands 52 c.m. (20.47 inches). Sophie's family is thankful for Ms. Quizel Espinosa, a midwife who handles the normal delivery of Sophie and assisted by Ms. Ainz Velasco in the Birthing clinic in our place. And also we thank the Lord for her parents as pro-creator of our Heavenly Father for His spirit children and one is Sophie Ashley Lory.